Material: Lava, 15 k Gold tested. Size: 2 1/8" by 1 7/8". Conditions: Conditions Excellent. No chips or cracks or wear on the carving. 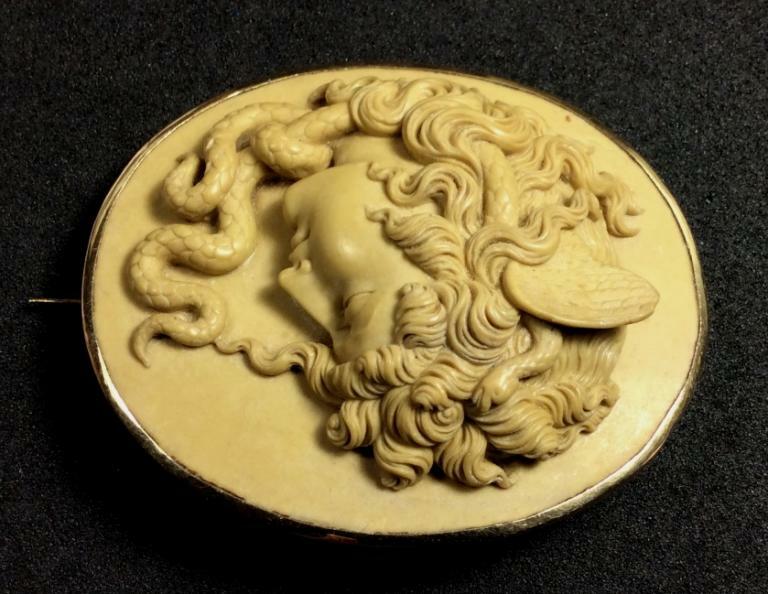 A slightest line in the stone at the bottom of the cameo, just under her hair, at circa 7.00 o'clock, another slightest line on the back bottom of the cameo, Mentioned for accuracy. 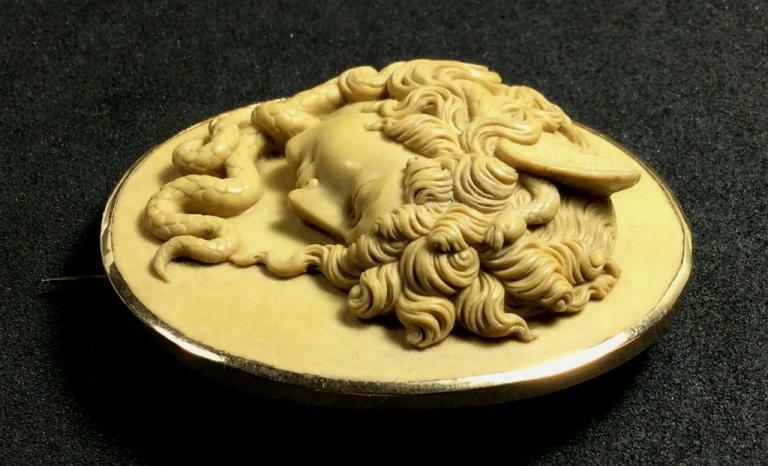 This is another highest Museum Quality depicting the Gorgon Medusa. What can I say about this wonderful work of art? Pictures speak by themselves. 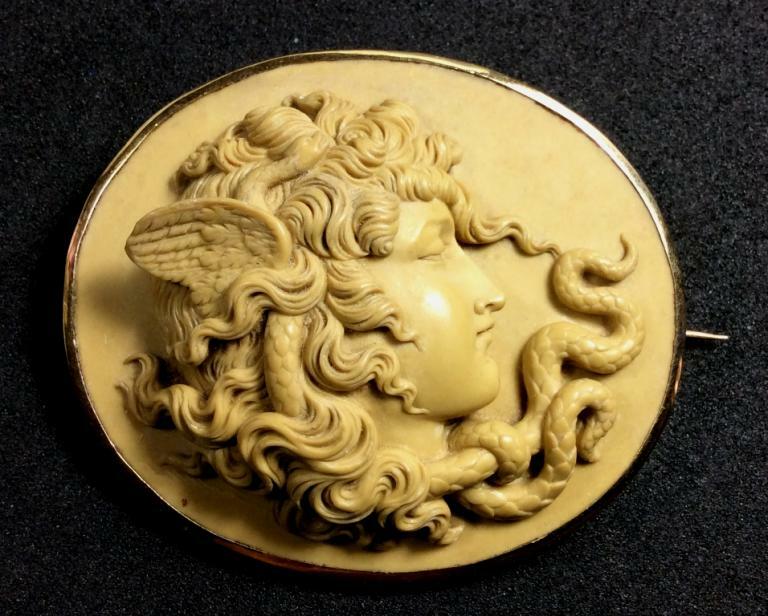 The three dimensionality of this cameo makes it even more precious and beautiful. Just an artwork. Her curly and long hair are intertwined with the snakes which form like a bow under her chin. Then you can look at her beauty, the pureness of the lines of her face are simply incredible, her perfect nose, her expressive suffering face. From the cold stone the carver was able to pull out something that is alive. This cameo is a stunning work of art, beauty and harmony. Looking at the pictures all the beauty of this piece can be clearly seen and it is something of really outstanding.The frame is simple just to give the right importance to that carved artwork. This is a piece that any Museum would compete to have, like most of my cameos which are really Museum Quality cameos. 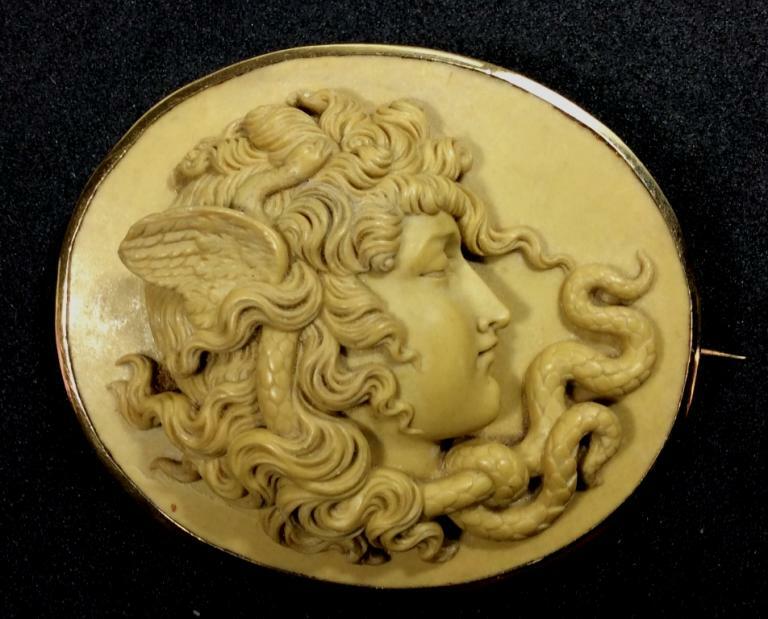 Medusa is a character of Greek's mythology, she was one of three Gorgons, the only one that was mortal. Poseidon fell in love with Medusa and one night he took her in a temple consecrated to Athena to consummate their love. Athena offended, transformed Medusa's hair into snakes and again everyone that had looked Medusa's eyes would have been petrified. 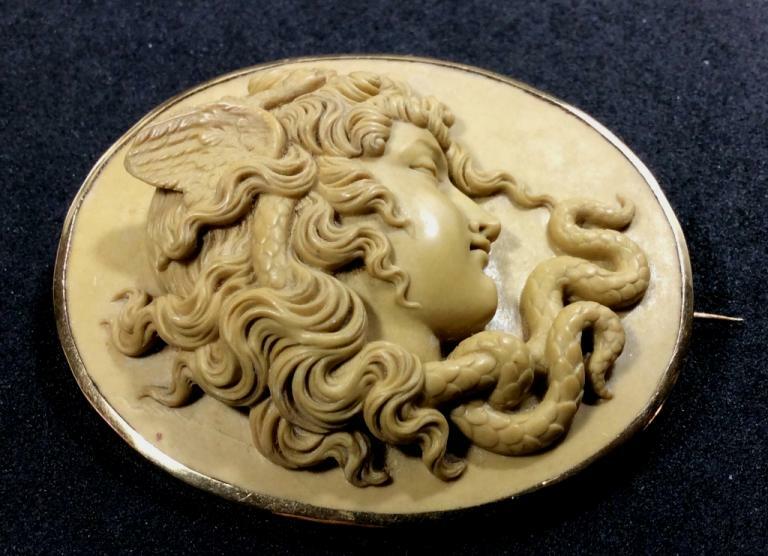 Medusa was killed by Perseus who cut her head looking at her through a bright shield received from Athena. From Medusa's body came out Pegasus, the mythic winged horse, and Crisaore generated with the union with Poseidon. 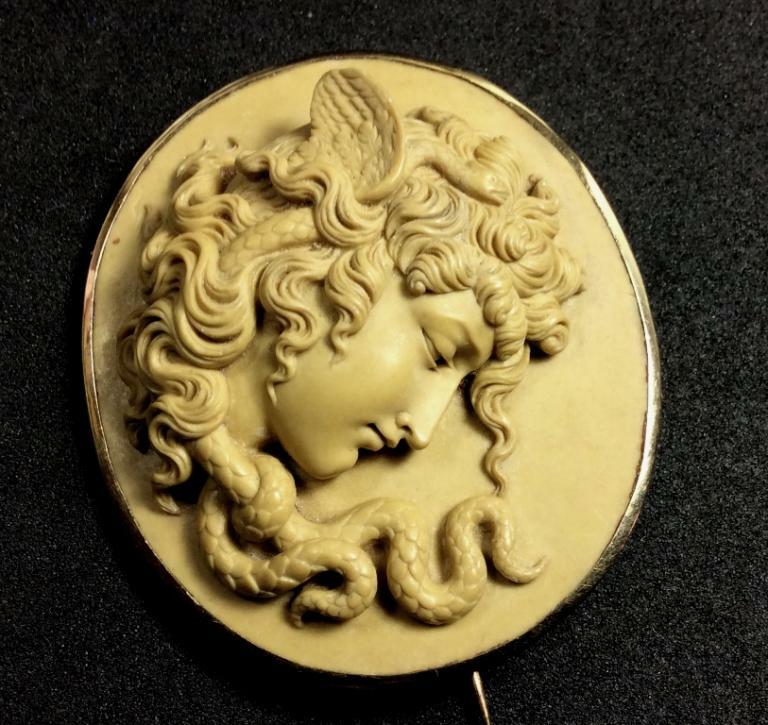 For this reason Medusa's head was given by Perseus to Athena who put it in the center of her aegis. 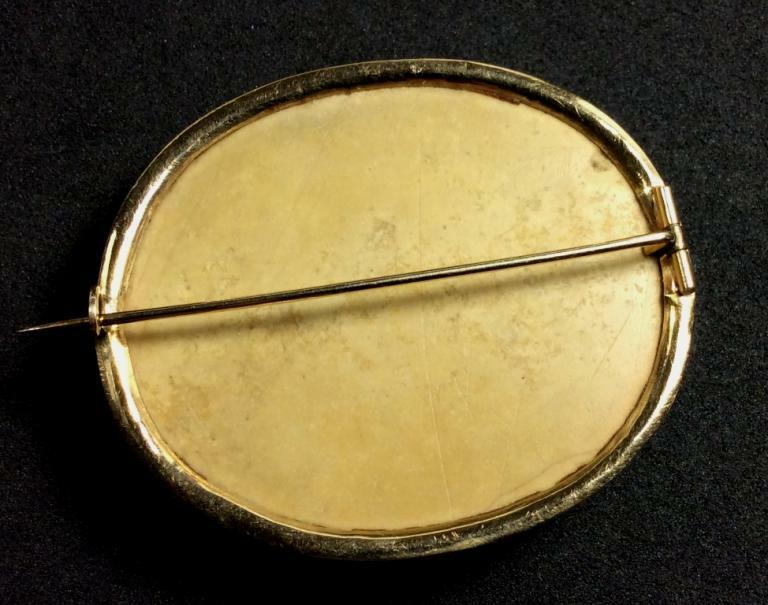 Aegis used by Athena, is a fringed armour or a shield with Medusa's head in the center.